Congratulations on your great Challenge Win! 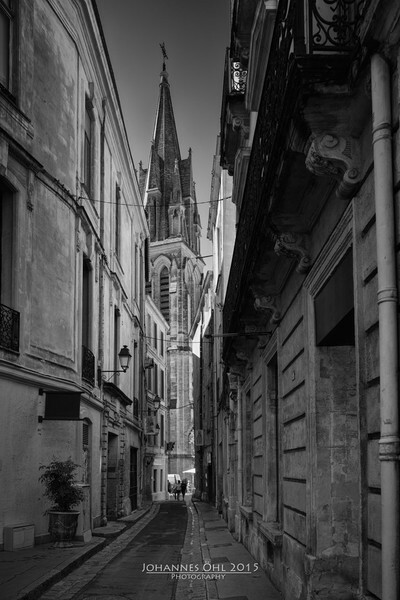 The alleys in the historic center of Montpellier, France are very narrow and scenic. They are inviting people to have a walk In the background is the tower of St. Roch visible. This photo was done during vacation in Montpellier/France in 2015. Together with my family we explored the city. And then I saw this awesome framing of this church. The photo was done shortly after noon. I used a Sony alpha 7R II with the Sony/Zeiss FE24-70mm F4 ZA OSS. No flash, no tripod. The view through the narrow alley with this leading lines is the perfect framing for the tower of the church. The people at the end of the alley are making the photo more vivid. I was inspired by fine-art architecture shots. The challenge was to get all the details of the important things, which are mostly dark in the foreground. The light on the tower was perfect. With Nik Silver Efex you have the full control of the photo. I darkend the sky (using the color-channel) and was giving a little bit more light to the foreground. The dark sky and the bright light on the tower makes this amazing effect. I have 2 bodies: Nikon D800 and Sony alpha 7R II. Depending what I plan, I decide which to take with me. If I am doing macros or tele-photos I use my D800 where I have a Sigma 50mm/1.4 Art, Nikon 24mm/2.8, Nikkon Micro Nikkor 105mm/2.8 and a Nikon 80-400 with a 1.4 TC. For urban exploration I use the Sony with an 24-70/4 lens. Often I have a Metz-flash or a Sony-flash in my bag. I have a carbon fibre tripod made by Gitzo with an Arca head. Do not make you photo to bright, because the range into the bright section of your photo is not as big as into the dark section. Even it looks completely black, you can get details out of it when doing the postprocessing. If it's white, it's white. No details anymore. The photo uses leading lines to guide you through the picture. The people make the photo more vivid and are giving a scale of dimensions.